Okay, everybody, the weather is looking great. Mostly sunny; delightful 72° for this weekend! 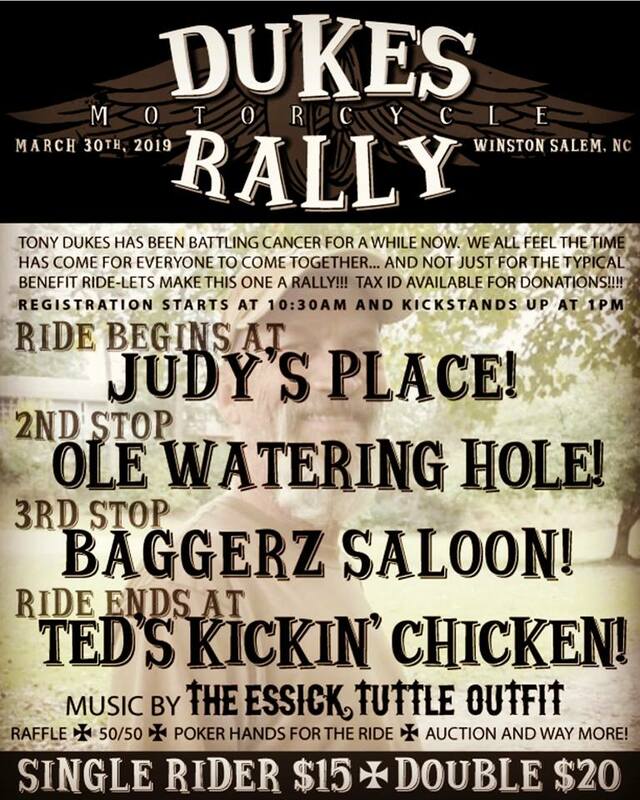 We want everyone that rides a motorcycle to come out to the Dukes Motorcycle Rally for my friend Tony Dukes! Judy’s Place Too. Kickstands up at 1:00. First stop is Ole Watering Hole. The second stop is Baggerz. The ride ends at Ted’s. The Essick Tuttle Outfit will be playing at Ted’s. We will have a raffle, 50/50 drawing, poker hands for the ride. They will also have lots of Silent Auction items and Raffles going on. One will be the last drawing Scott Ray did to help raise money for Tony Dukes I will have the 16″x 20″ Drawing on canvas of Jax Teller (actor Charlie Hunnam) Sons Of Anarchy. LifeWay for a Family Fun Day! 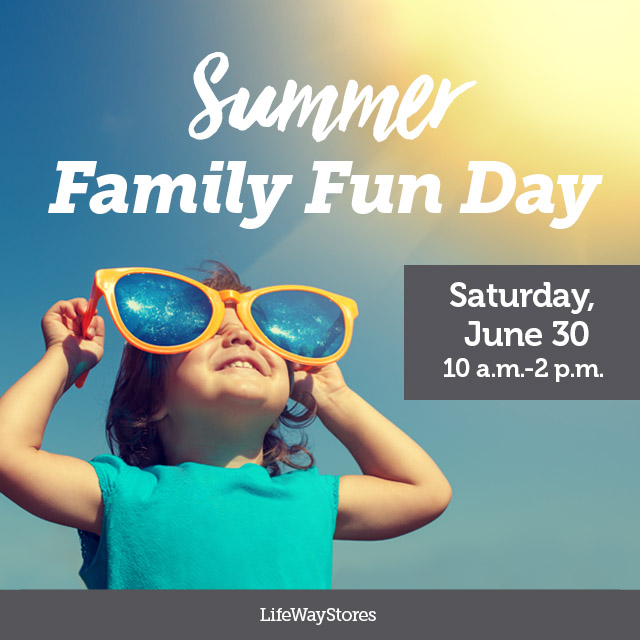 Unplug for a few hours and head to your local LifeWay for a Family Fun Day! We have some awesome live music. Also working on a few other activities. We are in the process of trying to get a deal on a hotel close by. If interested I will post the info soon. We also have Biker Trash Nation gonna be here with all the apparel you guys have been wanting!!! The ride will leave The Forgotten Sons Clubhouse at 12 and will stop at Second and Green Tavern, Pine Tree Bar and Grill, and then will end at Baggerz Saloon for the BTN anniversary party! You don’t wanna miss it!! Hope everyone will be there this is going to be awesome brothers and sisters coming together to make Christmas great for Kids. Toys for Tots – bicycle challenge!! Mark your calendars for this year’s Toys for Tots Benefit Ride put on by The Forgotten Sons MC! Last year we came together to put smiles on a lot of kids faces that aren’t as fortunate as we are. This year I know we can top it! Baggerz Saloon will be hosting the 2-year BTN anniversary party afterward. 2 years of fellowship, friendship, countless dollars raised for those in need, and last but not least FUN! You guys and gals have made it happen. This is a celebration for these kids and YOU! Come celebrate Spring and honor our veterans and their life changing service dogs! We will have a motorcycle ride through scenic Davidson county with kickstands up at 10am. Cost is $10 a motorcycle. There will be food, games and a 50/50 Raffle. Lots of prizes from our sponsors too! We already have (2) family passes to Kaleideum and (2) Day passes to US National Whitewater Center as raffle prizes. Stay tuned for more! Hot dogs will be on the menu courtesy of Cardinal Wings. Gunny Smitty’s will be on site selling his famous Kettle Corn and Fresh Lemonade!!!! Thank you to Cardinal Wings – NC M – Salisbury for putting this ride and fun together! Please contact Diane Davis at 704-202-9556 or Brigette Parsons 336-406-4177 if you would like to know more about the event. November 19th will be a full day of fun for you and your pooch to benefit AARF (Animal Adoption & Rescue Foundation). There will be a ride starting at 10:30am and registration is from 9 to 10:30am. $15 for single and $20 for double up. Purchase raffle tickets now until the event for $10 at Smokin’ or A Way To Go Travel in Greensboro and Burlington to win a trip for 2 to the Hard Rock Resort in Punta Cana, Dominican Republic.There will be vendors, door prizes, lunch from noon to 2 with hot dogs, chips and a drink for $5, Orange Carpet Dog show with AARF dogs up for adoption and the raffle drawing at 3 and you must be present to win. Representatives from the Hard Rock Resorts will be on hand for presentations on their beautiful resorts and more. Ride for Relief for West Virginia Flood Victims. Smokin’ Harley-Davidson is a drop-off location for non-perishable food items, cleaning, household and baby supplies. Please join us in Lisa’s Memorial Ride. Lisa was diagnosed with Bile Duct Cancer in December 2014 an the cancer continued to spread to her liver. This event will be to benefit her outstanding medical expenses and the financial hardship the cancer caused her and her family. We are saddened that Lisa left use on July 13, 2016. All proceeds raised will go directly to Lisa’s Family. Contact: Donna- 336-430-1025 to Pre Register. A fundraising event benefiting The Sergei Foundation to help save companion pets’ lives by providing veterinary financial assistance to families unable to afford emergency, life-saving care. For specific event competition times and details, please visit the events page.PETS ARE WELCOME! (Must be leashed, well-behaved and have proof of rabies vaccination). This is a rain or shine event! If there is lightening or severe weather, events may be delayed until it clears. COST: Required minimum donation of $6/person upon entry (kids 10 and under FREE). NO PARKING FEE. All to benefit The Sergei Foundation, a 501(c)(3) organization! Competitions have individual entry fees between $5 – $30. ALL DONATIONS WILL BE MATCHED for our sick and injured pet programs. Thank you for giving generously.